BARCELONA, Spain—Lionel Messi took his scoring prowess to yet another level on Wednesday, becoming the first player to net five goals in a Champions League game as Barcelona thrashed Bayer Leverkusen 7-1 Wednesday to ease into the quarterfinals. The defending champions already led 3-1 after the first leg and the three-time world player of the year put the result beyond doubt by scoring twice in the first half. Messi added three more after the break, while substitute Cristian Tello added a brace as the Spanish champions advanced 10-2 on aggregate. "I can't remember the last time I scored five goals, so I'm very happy," said Messi, whose 49 career Champions League goal puts him joint fourth on the all-time European Cup list alongside Alfredo di Stefano. "It's nice to score five goals." The 24-year-old Messi took his overall season tally to 48 goals and he is now just seven away from matching Cesar Rodriguez's all-time club record of 235. "He's the best (ever), there is no other like him," Barcelona coach Pep Guardiola said. "The numbers speak for themselves. One day he'll score six. We're very fortunate to have Messi, so we have to take advantage of him." 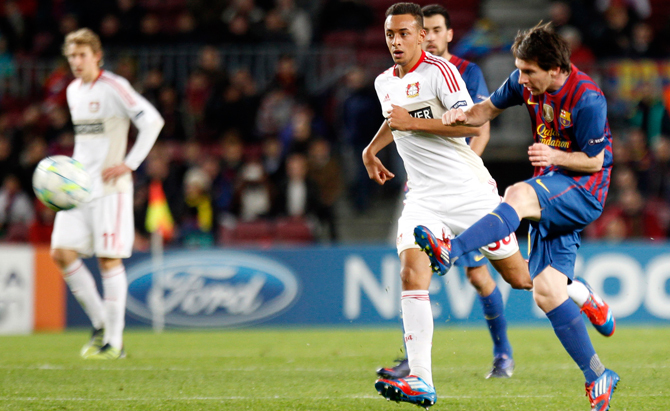 Messi is only the fourth player to score five goals in a European Cup match — and first since the 1978-80 season. It was the first time in his career that he achieved the feat in any competition. "His class is just extraordinary, there's no discussion," Leverkusen coach Robin Dutt said. "Without Messi, Barca is the best team and with him, they are in another galaxy." Despite Leverkusen's best intentions, the result was never really in doubt on Wednesday as the defending champions recorded their most lopsided Champions League victory. "What was important was to win," Messi said. "That's what we wanted to achieve, now we're in the quarterfinals and we did it impressively." Messi marked another astonishing night by testing goalkeeper Bernd Leno early before his 25th minute opener. Xavi timed a long ball perfectly for Messi, who beat the offside trap to come one-on-one against Leno and sent an almost playful chip over the goalkeeper. The second came after Messi received a pass from Andres Iniesta at the right corner of the area before skirting toward the center to curl a left-footed shot through a crowd of defenders and past a bewildered Leno in the 42nd. Messi continued in the same vein just four minutes into the second half as he timed his run to beat the offside trap and met Cesc Fabregas' long pass in the area, where the diminutive Argentine nicknamed "The Flea" held off defender Daniel Schwaab to complete a hat trick with another chip — this time from his weaker right foot. "We'll never see a player like him again," Guardiola said. "He is one-of-a-kind." Tello replaced Iniesta and showed exquisite control as he headed Fabregas' pass forward before curling the ball around Leno for 4-0 in the 55th. Three minutes later, Leno let a ball into his box slip away and Messi was perfectly placed to become the first player to score four goals twice in the knockout stages of the competition. Messi also scored four against Arsenal two years ago. "Messi is a joke. For me the best ever," Manchester United striker Wayne Rooney wrote on Twitter. Leno was to blame in the 62nd as he let Tello's curling shot from the left slip under his right hand in the 62nd. Tello joined former Barcelona player Txiki Beguiristain as the only Spaniard to score a pair of goals in his Champions League debut. Even Guardiola could only shake his head in disbelief as Messi added a fifth, curling an unstoppable left-footed shot out of Leno's reach in the 85th. Messi's 12-goal tally in the competition already matches his total from last season, which had also tied Ruud van Nistelrooy's record for a single season from 2002-03. "The important thing was to advance," Guardiola said, as his team joined AC Milan, Benfica and APOEL in the last eight. "The result after that was a consequence of our play." Karim Bellarabi scored a consolation goal in injury time for the Germans, who managed all four of their shots on goal after the restart, as Barcelona stretched its unbeaten run at the Camp Nou to 50 games. "We don't even need tonight to know they are the best team ever," Dutt said.